Can we work with the power of small? Typically the term “startup” connotes small groups of passionate people working away in obscure corners. They work and work, and after lots of sleepless nights and empty pizza boxes, aspiring to create something that would change the world. At some point, maybe earlier or maybe later, that innovation takes on a commercial component. This startup must grow! And the vehicle for this is inevitably commerce and “markets.” From here, the narrative of faster and slower takes firm hold, so much that it becomes intertwined and impossible for you to think of the “startup” without thinking of it as “business”. Is there another narrative that’s possible? In most cases, the startup itself was not a business; it was an innovation that the people behind it wanted to put out in the world, in service to the world. The vehicle to achieve this was business. At Startup Service, we come together each year to challenge this narrative. Not as a critique, but to create a space to ask the questions and think differently. Instead of looking at returns and profits can we imagine a different matrix? Instead of a labor of commerce, what emerges if we proceed forward purely as a labor of love? No compromises. We challenge ourselves to trust the universe, which is vast and beyond our full understanding, to provide not what we and our startup want, but what we need. Rather than only fundraise, we practice acceptance and humility, and try to recognize the many forms of capital that are around us. Can we creatively leverage them to work within our context? This leads to a different logic than the traditional startup optimization for big, fast, and scalable. Can we work with the power of small? Small is beautiful, because small is rooted in connections. And small is simple. When complexity drops, money can drop, and LOL (Labor of Love) takes center stage. Over the past three years Startup Service has evolved to become a one of its kind platform for “soulpreneurs” to birth labor of love ventures, to create ripples of positive deviance and social change by manifesting externally deeply held personal values and convictions. Over the last three annual events, Deven, Nipun, and the Startup Service Team have evolved the format. 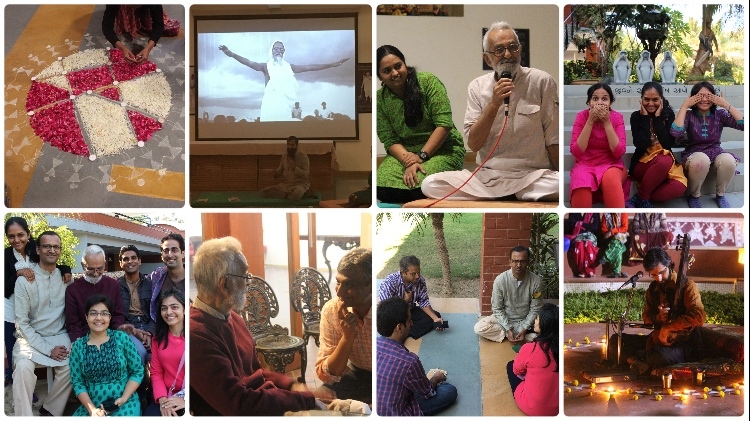 In this fourth iteration, 31 soulpreneurs were invited to ESI, outside of Ahmedabad, to gather for three and a half days. Participants came with projects at all stages, from conceptual seed to prototype to several years mature ventures. On the first day, after welcome and orientation, 21 of the participants gave a five minute pitch describing their LOL ventures. They focussed on what personal meaning their initiative had to themselves and the impact they envisioned for the audience they served. The “intentions” spanned agriculture, art, games, community building, acts of kindness, mentorship, youth programs, personal healing, and more. Parul and Gaurav shared their idea to connect startups in India with highly capable professional advisors, in the spirit of gift. Jaideep shared about Mentor India, an initiative with a group of like minded techies and writers to provide training and support to students in a pay-it-forward model. Nilima shared about her work to empower women, reconcile gender inequalities, and balance masculine and feminine energies through a entrepreneurship model she calls “Shaktipreneurship”. Jyotsna shared her reflections about empowering women through employment generation but leading with inner transformation: her current project ‘Maitri’ is to develop intergenerational wisdom amongst these women. Vijay shared about his project ‘Jagriti’ which aims to keep the rich tradition of artists from Kathputli colony alive by using their art as their means of empowerment. Of those 21, the collective cast their support for eight to be supported for the remainder of the retreat. Of those selected, two were asked if they would be open to anonymously paying forward their slot to two other participants in the top 10 whom the volunteer staff felt would benefit greatly from the weekend. Without hesitation, those two individuals silently gave their nod in agreement for the others. In that spirit, all participants self-selected into groups around each of the eight to make a commitment to support each intention for the remainder of the event. The eight selected LOL projects were to receive a very precious gift: a commitment from a group of accomplished individuals, putting aside their own work, with no agenda or strings attached, unconditionally lend their time, attention, and skills. “What you are doing is important. I am here to give you undivided attention and support to help you take next steps in achieving your vision”. For the group members, it was an opportunity to ladder another person with sincere motivations, and in this process also gain valuable insight and perspective on their own work. Groups spent the next couple of days (and nights :)) refining their intentions through the startup service canvas and through in-depth discussion with their team members. Team leaders brought out challenges and edges in their journey; group members listened, asked tough questions, and offered insights and expertise from their own journeys. Over three days, various activities were planned to help participants to reflect and think more deeply about their intentions. 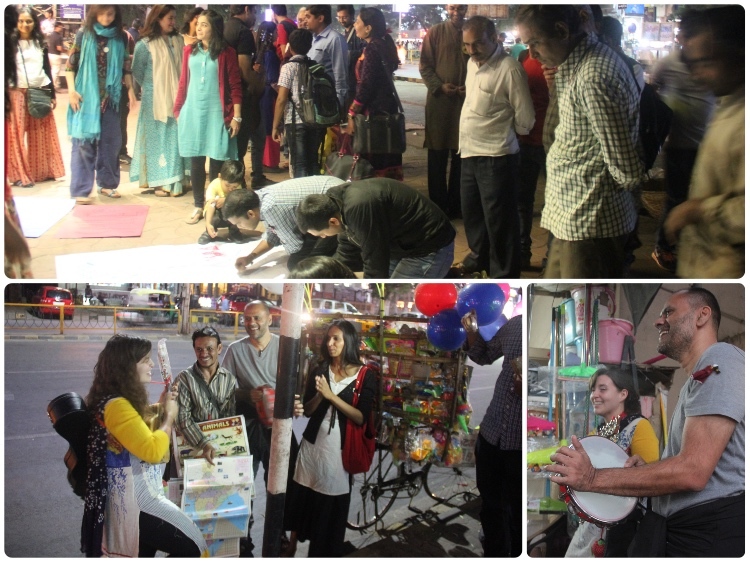 On the second day of the retreat, teams went out into the streets of Ahmedabad to practice the core values each project wanted to manifest in the world. Rupali’s “Discovering Yourself Through Art” team created a street mural and invited passersby to contribute. The Planet Earthlings team lead by Greg played the Acting Kindly card game with groups in the street. Sheetal approached a group of bank workers out for ice cream that caught on and thought they could play at their bank. 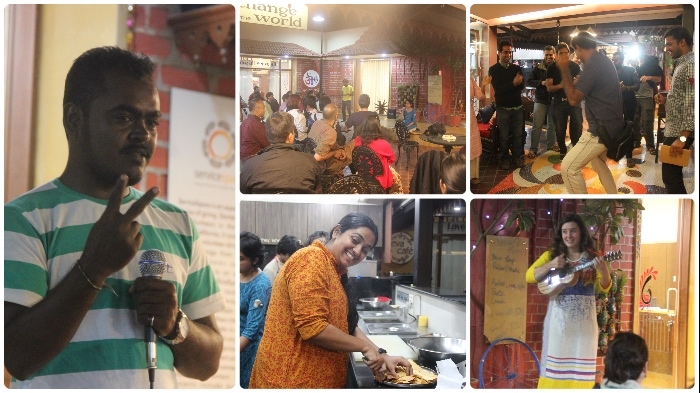 Nidhi’s “Just Being” team went into Seva Cafe and assisted the kitchen staff with preparing that evening’s dinner. They created their own healthy dosa dish and a tasty pancake dessert. During Seva Cafe visit, Bhaskar inspired us with stories about how this cafe, run purely on gift economy, has created shifts with guests; one police officer who was cynical of the “wealth” box later learned the power of it when he couldn’t bring himself to spend the notes he took from it (and instead gave back), and another woman who came to be nourished at Seva Cafe during her pregnancy even as the rest of her family ate at a nearby restaurant. Before dinner, Komnieve shared insights from his entrepreneurial journey, including the importance of selecting team members wisely and looking for people with a growth mindset instead of the smartest. Khitij shared about how his work as a social entrepreneur providing guidance counselling to government school students led him to learn about the importance of fighting the ego, despite success and accolades. Tootles shared a very touching, soulful song she wrote herself, the last one she shared with her brother before his untimely passing. In place of applause, she asked each person to hold a lyric of the song in their mind in silence. On day three Arun dada ,an 85 year old Gandhian and Rajni Bhakshi, an author, journalist and Gandhi Peace Fellow opened up the often not so well understood vision of Gandhi. Arun dada spoke of purification of the mind (chitt shuddhi) and the means to attain this (sadhan shuddhi ) as pivotal to all work. Rajni spoke about Gandhi’s idea of trusteeship and brought out a clear distinction between the ancient bazaars and modern markets and finding that balance for co-existence. She shared an example, of when Singer Company introduced hand sewing machines in India, Gandhi appreciated it because it did cut down the drudgery and was a good creative solution. She pointed that Gandhi’s vision of inner transformation and social change got quiet convoluted in fifty years of independence in the debate of traditional vs modern. And, that is where the point got lost because forward is not good to bad or bad to good, forward is different. She asked a powerful question — ‘In fifty years of independence the question is still the same - Are we truly free / Independent? Or are we more bound by the forces of the market?’ She shared that freedom is not a result and therefore Freedom has to be in the beginning not in the end. Capitalism has helped many people come out of abject poverty and overall lifespans have increased. Capitalism has given many other great gifts. So, can capitalism and love co-exist? Today capital markets are structured in a way that global markets are dictating every movement. Where is the space of ethical investment? And for real change do we really need 20 trillion? So many young people coming out of college have questions. What would you tell people like me who are tired of searching, especially when there is so much happening in the world? Can inner transformation be the fulcrum governing all work? You cannot solve the same problem with the same consciousness. What are the examples you are seeing where sadhan shuddhi has happened in business spaces? On the final day of the retreat, the eight groups presented their projects to the collective and a distinguished panel that included a grassroots changemaker, several social entrepreneurs, a CSR director, and a senior business leader. Rupali’s team presented their concept of birthing art circles in living rooms and studios everywhere. Preet’s #Happy2Give platform is an incubator for local, kind activities for a city near you. Kunal shared Chalees and his vision to transform learning by producing fun and engaging educational videos out of dry Indian textbook material. Bea wants to use art and the medium of paper to create cross-border collaboration, sharing and transformation. Nidhi envisions transforming her own home into a holistic healing space which integrates healthy food, mindful cooking, and strengthening yoga. Greg’s Planet Earthlings is a global platform for children around the world to collaborate on a kindness revolution, using online and offline games. Tanaz and her team shared their presence and the essence of Esta, which is about supporting and building community through the simple and subtle art of holding space. Deepika and her team presented their vision for empowering every woman and child in every village with a simple and cost-effective way for growing healthy food for family and community with Ganga Maa Mandal kitchen garden technique. Many thanks for your kind words...but it was equally my pleasure to be amongst you all...like Bapu's experiments with 'truth', your experiments with 'love' have engaged my attention. This time around, I noticed that the 'emotive' involvement and expression of the participants was much higher (last year the teams had a tinch of 'business sense') and also that in each of the pivotal participant — leading/driving the project — there was this deep sense of having found the right place and environment to pour out their real self and also possibly get selfless feedback. That each of them was moved in one way or the other was very obvious. 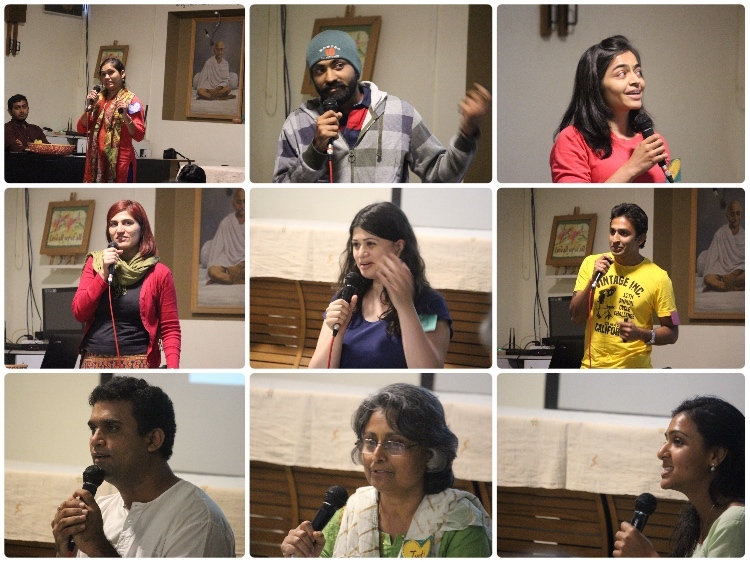 The group work and presentations were the visible fruits, but they were born on a field of incredible acts of kindness laid by participants and volunteers behind the scenes. Truly, there was a 9th invisible Startup Service group named “Epic Tags” that created non-stop joyful magic continuously. There was Nilima getting tagged with 8 extra copies of her book to gift to others, which required a volunteer to visit every bookstore in Ahmedabad. Vipul, served through his soulful Kabir music for an evening satsang, was left jaw-dropped to find that Sheetal, Neerad, Anupreet, and a team of invisible fans had designed and printed his first studio album, making the occasion the official launch. Neil was given a lifetime memory when a group of his staff members surprised him on stage and stood together as a team of CEOs. There was the hand-written notes and cards placed lovingly on every participant’s bed, put together with a prayer and deep spirit of compassion by volunteers. There was Deven’s (“Daadi wale Baaba”) tireless, continuous efforts starting several months in advance of the actual event, conducting phone calls with each and every participant and listening deeply to each one’s journey with a spirit of service. There was Vinit’s patient, quiet conversation with Trupti at Seva Cafe to help her gather her thoughts and deliver what one observer remarked was the best introduction of the space they’d ever heard. What a retreat it was, every-time I come home from the retreat, every-time I'm a little different person than who I was, I sincerely want to thank you all for the efforts you all have taken to make something like this a reality. This is the first time I've seen the other (volunteer) side of the retreat and I was amazed to see a full powerhouse in action. The way everyone comes together to put something like this come alive, oh my god, I was really blown away. I'm in debt of you all for this experience. As Nipun reminded us, in such gatherings we hold the possibility of creating 100 million trillion connections. And each of these are threads that contain the possibility of beautiful ripples. When we trust in the value of relationships we see the value of materials pale in comparison. May we continue to co-create, through our inner work manifested externally, a vast and deep field of goodness to embrace the entire world.